Sometimes luck is on your side. As it was this evening with this image, Heaven sent. 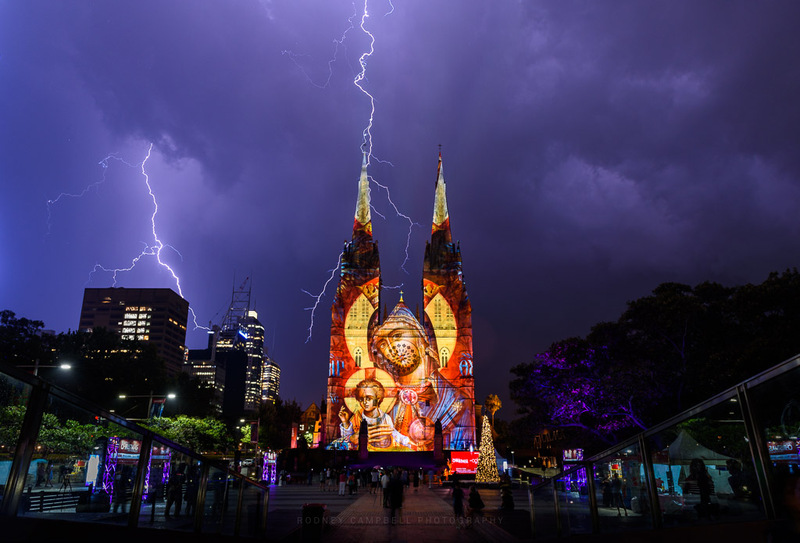 I was shooting the projections on St Mary’s Cathedral and had finished my insanely close ultra wide 12mm variants. I’d decided to move back for a longer view with a longer lens. I was just switching to the 24-70 when it started to sprinkle. I’m not sure why I didn’t pack up there and then but I decided to persevere even with the light rain. I didn’t have my wet weather camera gear with me so I wasn’t going to stay long anyway if it got heavier. Less than two minutes later we got some huge flashes of lightning and then it really began to pour. I was taking a frame at the time and even though it was only a few seconds long I managed to get the main two strikes in the frame. In a stroke of even better fortune as you can see it “looks” like the strike is directly in line with one of the main spires of my church. It really was Heaven sent. Satisfied I quickly moved for cover as the rain started to pelt down. Have a very Merry Christmas everyone and my best wishes for the year ahead.